Sailors, pirates, and the sick flame emblems that motivate them. The act of sailing is, more often than not, a calming experience containing occasional bouts of excitement. There's no part of drifting on open water that really gets your heart pumping, just like there's no part of keeping your ship afloat during a storm that will grant serenity. I mean, unless you count drowning. Windward, a game specifically about sailing, matches its subject quite well. When you find yourself in the midst of a massive, six-ship brawl with a friend by your side, the thrill is overwhelming to the point that nothing else can grasp your attention. Outside of those instances, though, the game is equal parts calm and soothing, if mildly repetitive. 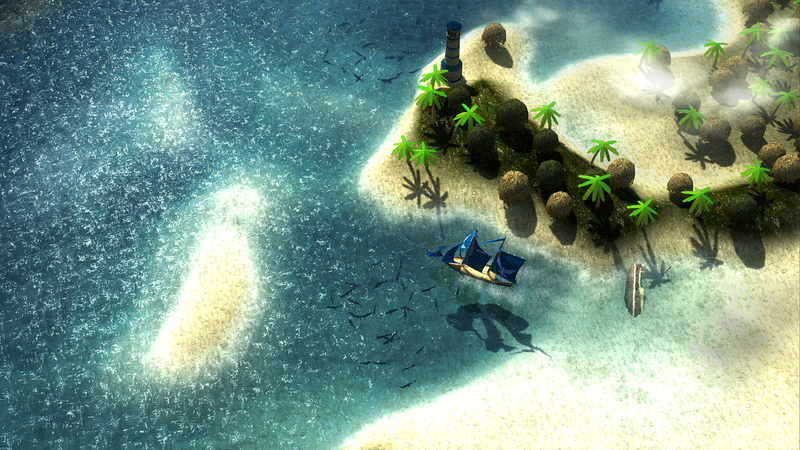 For a game priced at $14.99, Windward does a fantastic job of getting the most out of its engine. The ocean feels crisp and active, and the island vegetation feels appropriately lush or barren. In combat, your ships and cannonades seem to have weight and impact. As the wind tosses your sails from side to side or blows away a cloud of poison gas, you get the feeling that you are in an active world. Unfortunately, that’s where the game’s vitality ends. There is very little to indicate that the ports or the islands that house them are harboring any actual inhabitants, making you wonder if you've survived some sort of apocalypse that wiped out everyone but the sailors. The game's soundtrack harmonizes with this feeling. It’s a technically sound product that hurts from repetition or lack of variation, occasionally making the entire world feel devoid of life. Let's address something before we move on: Windward as a game appears to be built from the ground up for co-op. An option for solo adventuring exists, but given the repeatable nature of the questing and lack of any real story, it's hard for me to imagine myself getting very invested in that area of the game. Your time in the game is split between seizing territories from your opponents' control (be they pirates or enemy factions) and running quests in peaceful territories to attain the experience points necessary to advance. Of course, the two experiences will occasionally blend together: the traditionally peaceful quests will sometimes guide you into combat, and pirates will crop up from time to time to damper your peaceful cargo trading business. To a large degree, though, these two acts are done independently, which gives the game a nice flow. Where the game falters significantly is in the length of these sequences. Too often, I found myself lazily ambling across uncontested waters as I waited for the various quests, trade routes, and random loot to push me across the experience threshold needed to access the next territory. Unfortunately, the game opens in the downswing of this flow, and were it not for the presence of my co-op partner, I can’t say I’d have the desire to move much further. Page created in 1.7568 seconds.